Nieuwe FEC voor Rusiya Al-Yaum op 10891.80MHz, pol.H: FEC:5/6 ( SR:27500 SID:7 PID:519/1287 Arabic - FTA). Rusiya Al-Yaum in DVB-S op 11938.00MHz, pol.V SR:27500 FEC:3/4 SID:1883 PID:2103/2203 Arabic (FTA). Rusiya Al-Yaum switched to Eutelsat 7 West A satellite at 10892.00MHz, pol.H (DVB-S , 10892.00MHz, pol.H SR:27500 FEC:3/4 PID:519/1287 Arabic). PID zijn veranderd voor Rusiya Al-Yaum op 11996.00MHz, pol.H: PID:1032/1232 Arabic SID:38 ( SR:27500 FEC:3/4 - FTA). Rusiya Al-Yaum in DVB-S op 11319.50MHz, pol.V SR:27500 FEC:3/4 SID:17632 PID:1032/1232 Arabic (FTA). Rusiya Al-Yaum (Russia) is in DVB-S van start gegaan op 10949.00MHz, pol.V SR:27485 FEC:3/4 SID:6012 PID:1212/2212 Arabic - FTA. Rusiya Al-Yaum switched to Atlantic Bird 4A satellite at 10892.00MHz, pol.H (DVB-S , 10892.00MHz, pol.H SR:27500 FEC:3/4 PID:519/1287 Arabic). Rusiya Al-Yaum (Russia) is in DVB-S van start gegaan op 11623.00MHz, pol.V SR:27500 FEC:3/4 SID:5008 PID:519/1287 Arabic - FTA. Rusiya Al-Yaum (Russia) is in DVB-S van start gegaan op 10892.00MHz, pol.H SR:27500 FEC:3/4 SID:7 PID:519/1287 Arabic - FTA. Rusiya Al-Yaum (Russia) is in DVB-S van start gegaan op 11013.00MHz, pol.H SR:27500 FEC:3/4 SID:4 PID:260/516 Arabic - FTA. Rusiya Al-Yaum (Russia) is in DVB-S van start gegaan op 11996.00MHz, pol.H SR:27500 FEC:3/4 SID:38 PID:3860/3820 Arabic - FTA. A testcard identified Rusiya Al-Yaum has started in FTA on 10892.00MHz, pol.H SR:27500 FEC:3/4 SID:7 PID:519/. A testcard identified Rusiya Al-Yaum has started in FTA on 11623.00MHz, pol.V SR:27500 FEC:3/4 SID:5008 PID:33/. 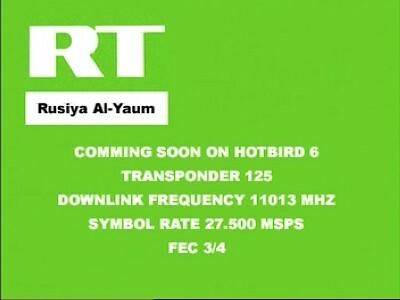 A testcard identified Rusiya Al-Yaum has started in FTA on 11013.00MHz, pol.H SR:27500 FEC:3/4 SID:4 PID:260/516.